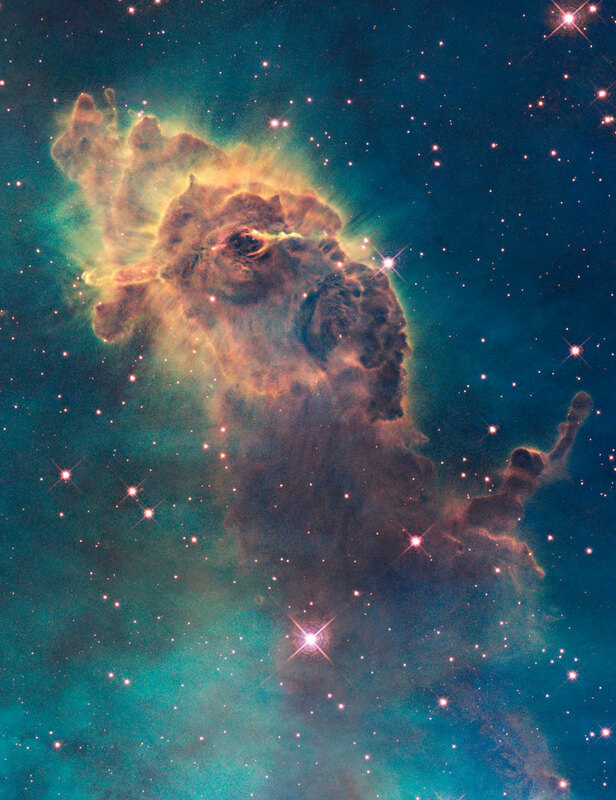 STScI-2009-25e - This image, taken in visible light, shows the tip of the 3-light-year-long pillar, bathed in the glow of light from hot, massive stars off the top of the image. Scorching radiation and fast winds (streams of charged particles) from these stars are sculpting the pillar and causing new stars to form within it. Streamers of gas and dust can be seen flowing off the top of the structure. Nestled inside this dense structure are fledgling stars. 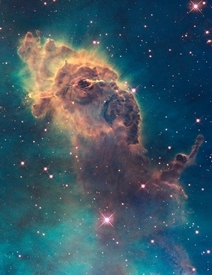 They cannot be seen in this image because they are hidden by a wall of gas and dust. Although the stars themselves are invisible, one of them is providing evidence of its existence. Thin puffs of material can be seen traveling to the left and to the right of a dark notch in the center of the pillar. The matter is part of a jet produced by a young star. Farther away, on the left, the jet is visible as a grouping of small, wispy clouds. A few small clouds are visible at a similar distance on the right side of the jet. Astronomers estimate that the jet is moving at speeds of up to 850,000 miles an hour. The jet's total length is about 10 light-years.